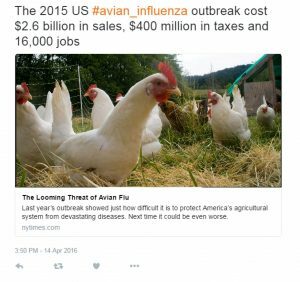 Avian Influenza (AI) is a viral disease that can cause significant mortality in domestic poultry. AI outbreaks, and subsequent control efforts impacts both the economy and food security. In 2014/2015, there were multiple AI outbreaks in Canada and the USA. This led to significant economic costs, job losses and resulted in shortages and price increases for certain poultry products. For example, the price of eggs more than doubled. 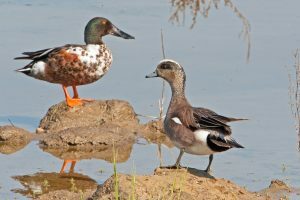 Wild waterfowl are the reservoir for AI Viruses, meaning the birds are hosts of the virus, but don’t often get sick. This is why wild birds are the focus of AIV surveillance programs around the world. Wild ducks are trapped, banded and swabbed to test for AI using a molecular genetics technique known as Polymerase Chain Reaction (PCR). This approach has significant limitations. It is time-intensive and costly to sample enough wild ducks. Indeed, these programs were in place in the USA and Canada in 2014/2015 and failed to predict outbreaks in either country. This failure of the wild bird surveillance caused the CWHC-BC to seek a better approach for detecting and characterizing AI in waterfowl. We have set out to develop a new technology for detecting AI by testing wetland sediment instead of birds. Indeed, we have found that wetland sediments are a suitable proxy for waterfowl surveillance. In a 2015/2016 pilot study, we used the genomics technology ‘targeted resequencing’ (in which a specific set of genes are isolated and sequenced) to identify the 2014/2015 outbreak AI virus in wetland sediments. This study was able to detect AI in up to 24% of sediment samples as compared to a < 1 % rate of detection in the current Canadian wild bird AI surveillance program. We also found that the outbreak virus was widespread in wetlands throughout the Fraser Valley and likely could have been detected in advance of the outbreak had this approach been available. Over the next two years you may see the CWHC BC team working in the marshes of the Lower Mainland. A new study has been launched to refine and validate the AI sediment surveillance technology and methods. The work will involve sampling both sediments and wild birds simultaneously in three key wetlands. This method will determine whether the AI viruses obtained from sediment is representative of those viruses circulating in waterfowl. 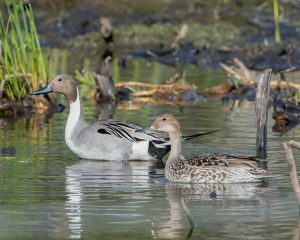 Additionally, sediment surveillance throughout the Fraser Valley in combination with testing of hunter-killed waterfowl will allow for a cost-benefit analysis to determine the best combination of sampling for accurate virus detection. Given the revolutionary nature of this approach, we anticipate that it may be more widely adopted, both nationally and internationally as the cornerstone of AI surveillance. As coordinators of the Inter-Agency Wild Bird Avian Influenza Surveillance Program, the CWHC will be instrumental in harmonizing AI testing and monitoring across Canada as well as internationally through its role as a World Organization for Animal Health (OIE) Collaborating Centre.